Jack Kerouac’s spontaneous, cross-country odysseys, fictionalized in his 1957 novel On the Road, may not have taken place on Route 66, but Route 66 likely comes closer than any other American highway to evoking the sense of possibility embedded in the travel experience. Ironically, Kerouac published his most famous work just one year after the passage of the Interstate Highway Act. 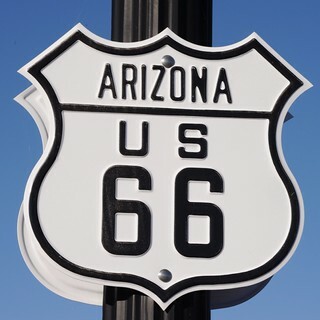 Recently, the National Park Service, in partnership with the American Express and World Monuments Fund Sustainable Tourism Initiative and the National Conference of State Historic Preservation Officers, created the Route 66 Travel Itinerary as part of the World Monuments Fund’s Historic Route 66 Project, which also includes a virtual reality tour and an economic impact study that recommends ways to encourage the revitalization of the Route 66 corridor. Chicago’s Grant Park, the subject of Timothy J. Gilfoyle’s essay in American Tourism, may not be the first tourist destination that comes to mind when one says “Route 66,” but in fact it is the highway’s eastern terminus and the starting or ending point on the NPS itinerary. Unlike Grant Park, which benefits from its central location in the nation’s third-largest city, most of the locales along the decommissioned highway lived or died according to the placement of parallel Interstate routes. With its promise of thousands of miles of limited-access freeways, the 1956 bill spelled the beginning of the end for countless American roadside attractions that depended upon motorists’ ability to stop on a whim. The Historic Route 66 Project reflects an interesting twist in the history of American tourism. In the 1920s Route 66, like the Santa Fe Railway a half century earlier, was simply a conveyance – a path between two points. But the tourist destinations it popularized ultimately became inseparable from the transportation experience itself. Now, five decades after the Interstate Highway System first threatened to send Route 66 into a dark twilight, the road itself – and the living memory of travel experiences along its path – is a reminder that a ribbon of asphalt looms as large as the most popular destinations, if only in the American imagination.